Summer is coming to an end for a lot of kids and we had a bunch of families fishing here the past couple weeks. School is starting back up now so the family travel is slowing down, but it was nice to see the next generation of fishermen and fisherwoman get on and off the boats each morning! The mahi bite has been on and off in august. We did see a couple more SLAMMER BULL'S, including a 50.5 lber on the redfish and a 40.2 lber on the cloud nine! The first week of August was pretty good overall but the last week has been hit and miss. A few boats each day would still come back in with a box of fish but when half or more of the boats struggle just to catch a few fish it definitely isn't as consistent as we like to see! A lot of boats were finding plenty of fish but there was tons of undersize mahi, which we call "shakers" , since we shake them off next to the boat back in the water. It's always fishing so nothing is a guarantee, but all the boats here always give it a good effort! Other offshore fish we have seen include blackfin tuna and then some deep drop fish like grouper and tilefish. I think the dolphin bite will pick back up with this south east wind, as we usually see some gaffer size fish this time of year in the 8 - 15 lb range. Blueline tilefish and snowy grouper will remain open the rest of the month but come September we won't be able to keep them. In addition to the tuna on the humps we have seen some big dusky sharks too!!! Our friends also caught a nice wahoo on their private boat trolling one day as well. The snapper bite the last couple months has been great on the reef. It was one of the best years we have seen on mangrove (gray) snapper, so that made up for some of the slower mahi days the past week. The Miss Islamorada Party boat has been on them almost every day, with the exception of a couple days when the water was very clear and the current died. Some of the charter boats also threw some yellowtail action in the mix. With the live baits out we saw a few kingfish on the wrecks and reef as well as some big yellowjacks. Way offshore the swordfish bite has still been slower than normal, but the Catch 22 did have one very exciting trip where they were fighting a swordfish and a mako shark bit the tail off! 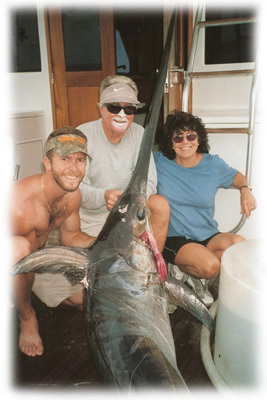 The got the majority of the swordfish in and then caught the mako shark on a small piece of the swordfish! Tight Lines and remember to call the marina office at 305 664 2461 to book you're next Islamorada Fishing Trip! We have hotel tooms and houseboats for lodging options on property as well! !